We’ve been having cold, snowy weather lately, including some below zero days. On one of those cold nights, our friend’s supermarket burned. As it’s the only one in Cook (our nearest town) a whole lot of people will have a long drive to get groceries! Several fire departments struggled all night in that below zero weather to try and get the raging fire out. McDonalds, next door, stayed open all night to supply the firefighters with hot coffee and sandwiches to keep them going. The store is a total loss. We feel so bad for Matt, the owner, but were heartened to hear him say, “it’s just a building; nobody was hurt” and that he plans on rebuilding as soon as possible. 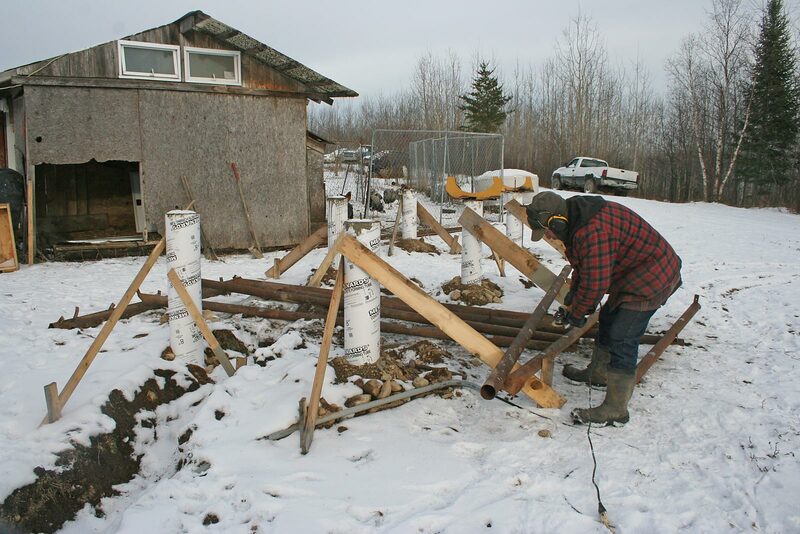 Will is working on the rack which will hold our ten new solar panels. He’s building them out of 2″ pipe which David salvaged from a disassembled barn years back, along with other salvaged steel and assorted parts. It helps a lot that today it’s above freezing — just barely — but that sure makes handling steel much easier. Will is spending most of his time working on the rack for the new solar panels. We have eight new 6-volt golf cart batteries ordered as our old ones are pretty dead. David plans on picking them up at his brother, Bill’s, this weekend when he goes down there for deer hunting. It’s funny; he drives 100 miles to hunt and we usually have six or seven deer grazing in our pastures during the day! Yea, it’s the deer camp camaraderie … You know, the “guy” thing. It would be nice if he would get a deer. Last weekend, he never saw one. I’ve been working at getting ready for Thanksgiving by cleaning up some of my seed-saving mess and assorted boxes of this and that which have become lodged in the living room. 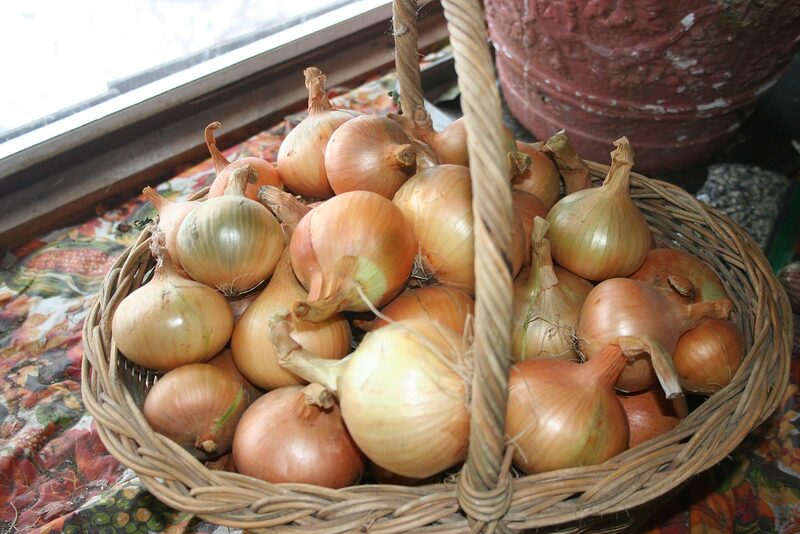 (Hmmm that’s where those books were …) In this clean-up, I put all of our onions — which had been drying on the tables in the sun room — into baskets. I was so tickled at how nice they turned out as it was so rainy the leaves hadn’t dried before I had to pull them ahead of freezing. I was worried they would get neck rot, as they often do when fall rains don’t let up, but they are perfect! Aren’t these onions pretty? I have four baskets full! Yes, it is! We sure appreciate ours, especially today with its four inches of new, wet snow. Ish! Back Woods Home– back in print ??? Really, Reg! Basically, Sam Duffy, Dave’s son, is going ahead with bringing BHM back in print in all its glory. If you click on the green box up on my blog in the right hand corner, you can get all the details and also subscribe if you choose. We’re really happy about this as I, for one, want to hold a magazine in my hands when I read. I didn’t think I would really miss the printed BWH until I went to the computer edition. It was so difficult to read, I just gave up and moved on. But now, I’m back ready to try to find someplace to store the collection again. Glad to see the real magazine coming back. Sorry to hear about the local grocery store. I gave them my business when I was in Cook instead of using the big stores. I am proud of Matt for planning to rebuild and know it will help many. When does the print of Backwoods Home begin? I just got out my heavy winter boots. Stay warm. We are so sorry too. Zups is a true family business and has helped the community in so many ways through the years. My youngest son, David, worked there for two years as he went to college and has started a fundraiser through his Facebook page (David Clay), to help out some. The response is heartening. The print issue will begin with the next issue. You can click on the green box (upper right) on this blog to find out more. We just got four inches of wet snow. Yuck! Your onions are beautiful!! They look so good!! Can’t wait for your new catalog for garden seed. We are finally back to the 30s too. We need some snow cover if it’s going to be cold again. Happy Thanksgiving to you and your family!!! Sorry to hear about your grocery store. Maybe you could have an old fashioned “Store” raising!!! No, that’s not a possibility due to building codes in town and insurance. The closest the community can do is pray and help by sending a little cash to the fundraiser on my son, David Clay’s Facebook page. I know he won’t raise millions but anything will help cheer up Matt, the owner and will help some.